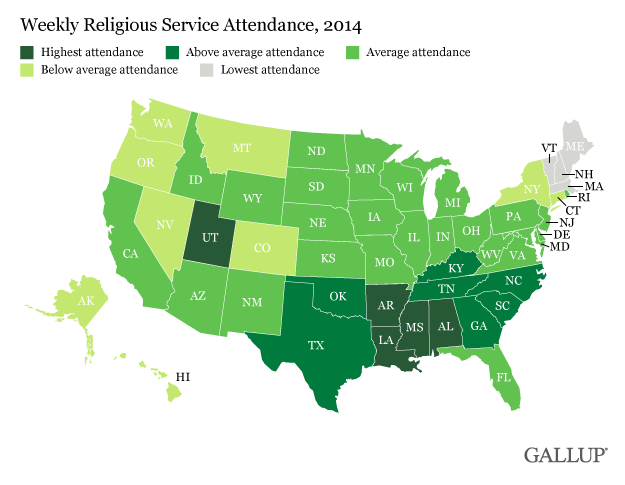 How Does Your State Rank in Church Attendance? This ought to give the atheists and leftists lots of ammo against the Bible-thumping cons. Utah is certainly no surprise. California with â€œaverageâ€ is surprising but note Nevada. For a state where Mormons dominate politics, that's pretty amazing. Re: How Does Your State Rank in Church Attendance?
. California with â€œaverageâ€ is surprising but note Nevada. For a state where Mormons dominate politics, that's pretty amazing. Not really...illegal aliens praying they don't get caught/deported. it's not surprising, if you think about it. Only 5% of the population of Nevada are LDS. The state population is 2.9 million, of which 2 million (65%, roughly) live in the Las Vegas metropolitan area- hardly a bastion of traditional Sunday-go-to-meeting types. California with â€œaverageâ€ is surprising but note Nevada. For a state where Mormons dominate politics, that's pretty amazing. CA surprises me a bit, but there are a lot of Hispanics in CA, and they are heavily Catholic and Evangelical. As for NV, BD nailed it. Las Vegas and Reno have a strong religious minority, but they are a minority. The segments of the hospitality and entertainment industries that are strongest in Las Vegas and Reno probably don't attract many church-goers, nor, likely, are many workers in those industry segments. New England is lowest ... not much surprise in that. Much sadness, but not much surprise. I always found New England just very parochial and unwelcoming place. My home state is below. My current state is above. My possible future state is average.